The Zeikos ZE-SB1000 Digital Autofocus Power Zoom i-TTL Flash is an innovatively designed flash unit for both digital and traditional SLR cameras with a wide array of high-end features at an affordable price. This model — compatible with Nikon SLR cameras — features fully automatic i-TTL operation and helps photographers fill shadows, add depth, avoid red-eye and improve image resolution. 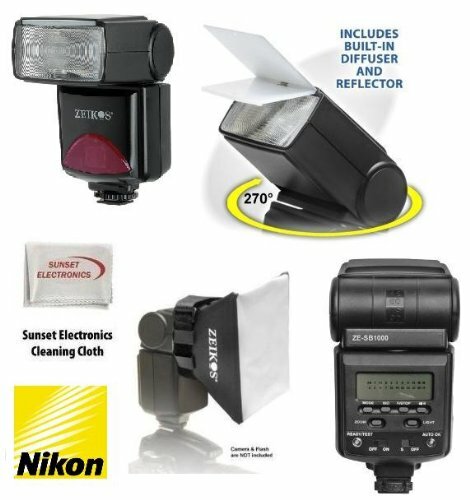 FLASH FEATURES: Full automatic i-TTL operation / Zoom, Bounce and Swivel Head / Built-In Diffuser and Reflector Panel / Wireless Slave Flash capability / Powered by 4 AA-size batteries. * Power Saving Function ( even through the flash unit is automatically cut off, it will still use up some of the batteries energy. Therefore, when the flash will not be used for a long period, it is recommended to set the Power switch to off position.